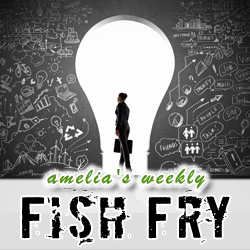 This week’s Fish Fry is a feast of EE awesomeness but don’t just take our word for it. Pull up a chair and dig in! First, we’ll whet your appetite with some unique research from the Korea Advanced Institute of Science. We check out how a team of researchers from KAIST hope to stem the tide of counterfeit parts, one silver nanowire fingerprint at a time. Next, we toast the winners of Newark element14’s Smarter Life Challenge with Dianne Kibbey (element14). Dianne tells us about the winning projects from this years contest and gives us a tasty sneak peek into element14’s next design contest. To finish off this week’s episode, we serve up some sweet analog-to-digital conversion with high speed converters. The dinner bell is ringin’ – it’s time for Fish Fry.